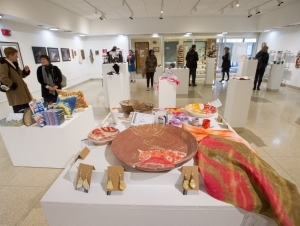 If you didn’t find the unique gift you were seeking on Black Friday or Cyber Monday, Buffalo State art and design students may have the solution. Undergraduate and graduate students enrolled in the newly configured Art and Design Department are selling an assortment of artwork during the 21st annual Student Art Sale on December 6 and 7 in the Czurles-Nelson Gallery in Upton Hall. From 10:00 a.m. to 7:00 p.m. on Wednesday, December 6, and 10:00 a.m. to 4:00 p.m. on Thursday, December 7, the campus and community can browse the many paintings, photographs, ceramics, scarves, jewelry, notecards, and furniture that comprise the sale. She said students are encouraged to keep their prices affordable for shoppers on a variety of budgets. And they are still able to garner a higher percentage of the sales—75 percent—than traditional galleries offer. The other 25 percent covers advertising for the following year’s sale and benefits all the visual arts and design programs. Since the sale’s inception, the programs have received nearly $10,000 in proceeds. For more information, call (716) 878-4986.